In the article from the Labour friendly Western Fail, Paul Flynn stated the following. Regular readers should have expected a table like this. In the few days since I made the last one comparing Owen Smith and Jeremy Corbyn the they work for you website has kindly added a few more into the mix. All of which took place on, you've guessed it, July 11th. Paul Flynn goes through stages of following me or blocking me depending on what sort of mood he is in. At the moment we're in the blocking stage so I had to go through the rigmarole of logging out in order to look for this following tweet. 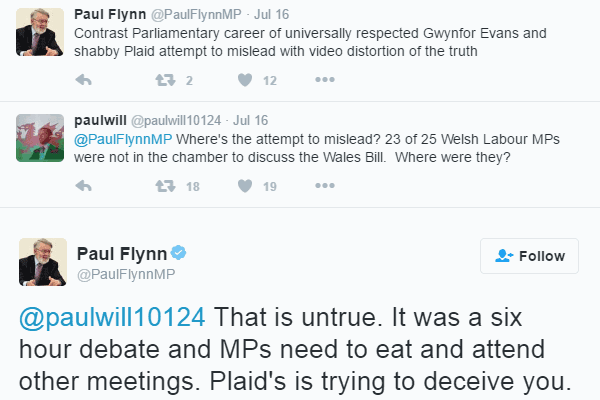 So what Paul Flynn is saying is that during the six hour debate some MPs needed to eat and attend meetings (that were clearly more important than a debate on Wales). The above quote from Flynn is expanded on in Flynn's blog. 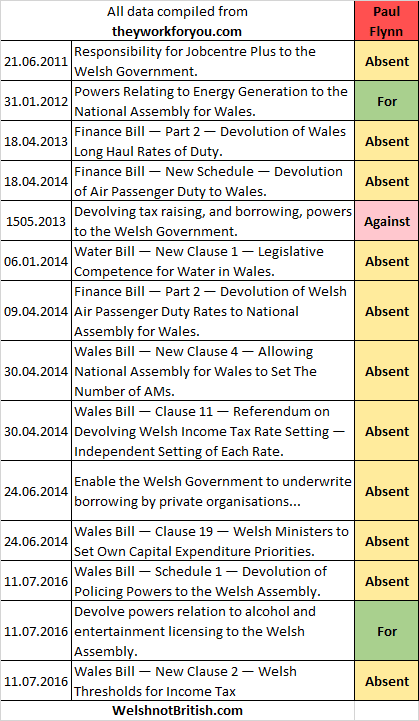 For the benefit of their supporters Plaid has now fictionalised their narrative of the bill with an account that casts their MPs in heroic roles - as the sole defenders of the nation. 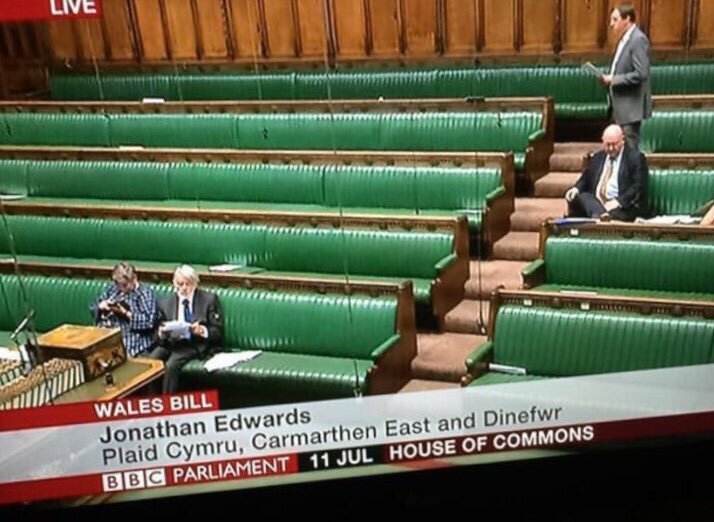 They illustrate their spin with a wholly misleading video wipe falsely claiming that Labour Welsh MPs were generally absent. They were not. They played their full roles in the debates. 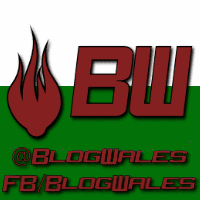 Some of Plaid's more gullible supporters swallowed the fiction and who have been indignantly twittering. Swiftly it's descended into an ignorance-rich sense-free zone. Trying to explain that absence from the Chamber for the second on the video grab did not mean absence absence from the debate and certainly not absence from the votes does not cut through to some of the tweeters hellbent on creating their own self-serving fantasy. Let's just enlarge the bottom part of the votes table from above shall we? Paul Flynn was correct, the single frame from the TV feed, which showed Paul Flynn (as one of only two Labour MPs) attending the debate on July 11th doesn't actually mean that he was there all the time or that he voted on all of the issues on July 11th. From the above chart we can clearly see that he couldn't be bothered to vote on two of them. But then Paul would probably say that you're gullible for believing this so feel free to check the data on they work for you yourselves.